Jeremy Hawkes film by HW Collective. Jeremy Hawkes' story has recently been shown in a short documentary film, The Ghost in the Machine, produced in collaboration with Northern Rivers-based film makers Sophie Hexter & poppy Walker of HW Collective. Diagnosed with early-onset Parkinson's Disease, Jeremy suspends his medication, allowing the tremors to suffuse his work. Jeremy's exhibition Carapace is now showing at lone Goat Gallery until 11 July, featuring a projection of the The Ghost in the Machine. 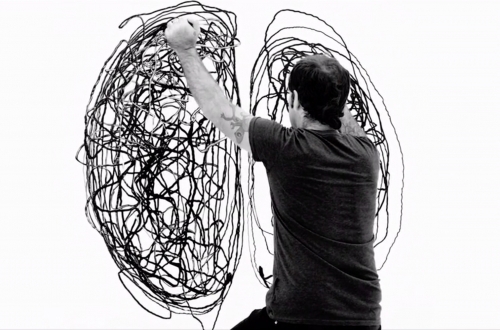 The opening night will feature a live performative drawing by Jeremy of The Ghost in the Machine. The resulting drawing will remain on show throughout the exhibition.